The Spokane City Council overrode Mayor David Condon's veto of a renewable electricity ordinance. 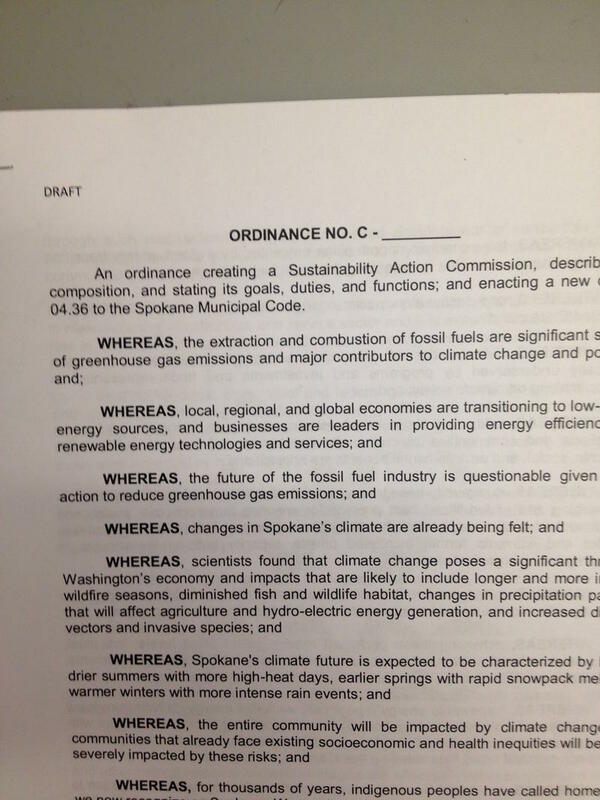 The Spokane City Council has overridden Mayor David Condon’s veto of a renewable electricity ordinance. Six council members voted for the override, one more than was needed. The measure pushes the city to run its own operations exclusively using renewable electricity sources, such as water, the sun and wind, by the year 2020. It also urges a goal of 2030 for 100% electricity from renewable sources for the rest of the city. The ordinance received public support from Avista, but it was the subject of a critical letter by Greater Spokane Incorporated and Better Spokane. Sherry Barnett, who supported the GSI position, urged the council to give more credence to business claims that the measure would drive up electricity and utility rates. Council President Ben Stuckart answered her. Councilwoman Karen Stratton said her office received 112 emails on this topic since the mayor’s veto was announced, all supporting the override. The ordinance creates an 11-member citizens’ commission that will provide the city with ideas for reducing the city’s greenhouse gas emissions. That will include representatives from the city, business and Avista, but also from low-income people and environmental groups. On Monday, the Spokane City Council will take up an issue inspired by climate change. The council will hold a hearing and perhaps vote on a proposal to create a Sustainability Action Commission. Its job would be to review and update the city’s Sustainability Action Plan, approved in 2010. That included a provision to reduce the city’s greenhouse gas emissions by 30% by 2030. Last year, the city council put into law those emissions goals. This new version would push the city farther.